Laysan is a 913-acre (3.69 km2), low, sandy island with a natural lake in its interior, one of only five such lakes in Hawaii. It has arguably the most diverse ecosystem in the NWHI, and hosts about two million seabirds of seventeen species. The Northwestern Hawaiian Islands were formed, approximately 7 to 30 million years ago, as shield volcanoes over the same volcanic hotspot that formed the Emperor Seamounts to the north and the Main Hawaiian Islands to the south. As the Pacific Plate moved north and later northwest over the hot spot, volcanic eruptions built up islands in a linear chain. The isolated land masses gradually eroded and subsided, evolving from high islands in the south, much like the Main Islands of Hawaii, to atolls (or seamounts) north of the Darwin Point. Each of the NWHI are in various stages of erosion. Nihoa, Necker, and Gardner Pinnacles are rocky, basalt islands that have not eroded enough to form an atoll, or lack a substantial coral reef. Laysan and Lisianski are low, sandy islands that have been eroded longer. 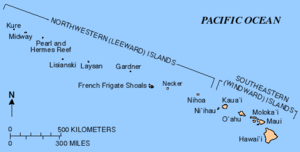 French Frigate Shoals, Pearl and Hermes, Midway, and Kure are atolls. North of Darwin Point, the coral reef grows more slowly than the island's subsidence, and as the Pacific Plate moves northwest, the island becomes a seamount when it crosses this line. Kure Atoll straddles Darwin Point, and will sink beneath the ocean when its coral reef cannot keep up with the rate of subsidence, a destiny that awaits every Hawaiian island. 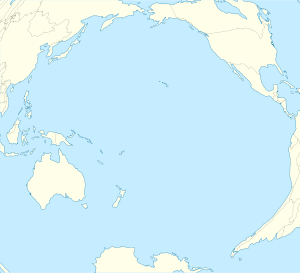 The Hawaiian Islands are about 2,500 miles (4,000 km) from North America and 3,800 miles (6,100 km) from Asia, and it is because of this isolation that the Hawaiian Islands have extraordinary numbers of unique species. Only a species that could fly or swim immense distances could reach the archipelago. But whereas Polynesians, and later, Europeans, have largely altered the ecosystem of the Main Hawaiian islands by introducing alien species, the ecosystems of the NWHI remain, for the most part, intact. The extensive coral reefs found in Papahānaumokuākea are home to over 7,000 marine species. Of the many species that live here, over 1,700 species of organisms are endemic to the Hawaiian Islands (i.e., they are found nowhere else). For this reason, the region has been dubbed "America's Galápagos". Some of the endemic species of the NWHI include the Nihoa and Laysan finch, the Laysan duck (the "rarest native waterfowl in the United States"), and the Nihoa fan palm. Other notable species are the Laysan albatross, the highly endangered Hawaiian monk seal, and the green sea turtle. The only native trapdoor spiders in the Hawaiian archipelago (Nihoa spp. ), recently discovered, are found only here. Most endemic species are highly vulnerable to extinction as one major catastrophic event could wipe out all of the vegetation on each small island. Additionally, seventy percent of all coral reefs in the United States are found here. In August 2016, President Barack Obama expanded the area of the monument by roughly four times. The expanded monument was at that time the world's largest marine protected area.